The People’s Democratic Party (PDP) in Kaduna at its Executive Committee meeting on Friday informally endorsed former National Caretaker Committee Chairman of the party, Senator Ahmed Makarfi to run for the number one political office in the country. The party’s loyalists, who filled the conference hall at the state Secretariat in Kawo, Kaduna, to capacity during the first of its kind meeting of recent, expressed optimism that Makarfi was the right man for the job. 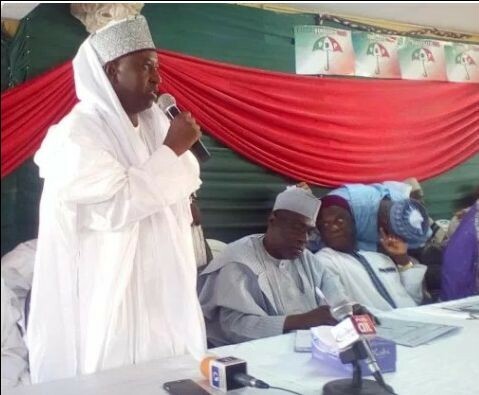 The immediate past governor of the state, Dr. Mukhtar Ramalan Yero, who was the first to address his party’s members asked them, if they would support Makarfi for President and a thunderous response of ‘Nigeria sai Makarfi’ rendered the air in affirmative. But when the meeting was over, Makarfi himself declined to talk to the press as he walked down the hall in a company of other party’s big wigs in the state. Should he agree to contest as been suggested to him, he would be facing other top contenders, including former Vice President, Alhaji Atiku Abubakar who for now, seems like the most popular candidate. Others who may have signalled interest are former Jigawa State Governor, Alhaji Sule Lamido, incumbent Gombe Governor, Ibrahim Dankwambo, former Kano State Governor, Malam Ibrahim Shekarau and little known Umaru Saidu from Nasarawa State. Whoever emerges from the party’s primaries would be slugging it out with President Muhammadu Buhari if he decides to contest, and wins his party, the All Progressives Congress (APC) primaries, or whoever emerges the party’s candidate in an election many believe would still go either way. PDP is however, being tipped to have a bright chance by several political analysts who are of the view that the electorate are patiently waiting for the election year to make another choice following what many described as failure to fulfil electoral campaign on the part of ruling APC. Others are hoping that if the states assemblies can ratify the earlier endorsement of independent candidacy, it may give yearning Nigerians a leverage to elect their preferred representatives without any political party.